In August, base leadership at Edwards Air Force Base, Calif., came together for its annual strategic planning meeting where each organization was represented to provide inputs and come up with a path forward to meet goals of the Air Force and the National Defense Strategy for the new fiscal year. 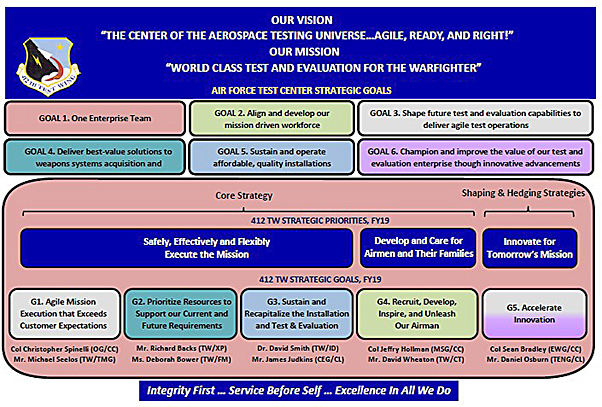 The resulting product from that meeting is the Fiscal Year 2019 Test Wing Strategic Action Plan, which was released this past week by Brig. Gen. E. John Teichert, 412th Test Wing commander. The core strategy focuses on the Edwards mission of supporting the warfighter by testing aircraft and weapons systems for the Air Force’s Global Reach, Global Vigilance and Global Power capabilities, which involve almost every aircraft type in the service’s arsenal. The shaping and hedging strategy focuses on innovation and emerging technologies, two concepts the 412th Test Wing needs to be in the forefront to ensure the Air Force can fight the wars of tomorrow. Part of accomplishing these goals would be to continue to innovate at the local level and engage the resources outside of Edwards AFB. Each goal has action items laid out and two senior base leaders to oversee them. Additionally, the general also has personal priority items he wants his leadership staff to address that include local innovation, civilian hiring timelines and on-base school quality. To view the entire FY19 TW Strategic Action Plan, visit https://www.edwards.af.mil/Portals/50/documents/FY19%20Strategic%20Action%20Plan%20-%20Final.pdf?ver=2018-10-24-141849-113.